This recipe came from a favorite recipe source in our FIT4MOM village, Skinnytaste. I tried a few little tweaks and even made it in bulk and froze some for later. 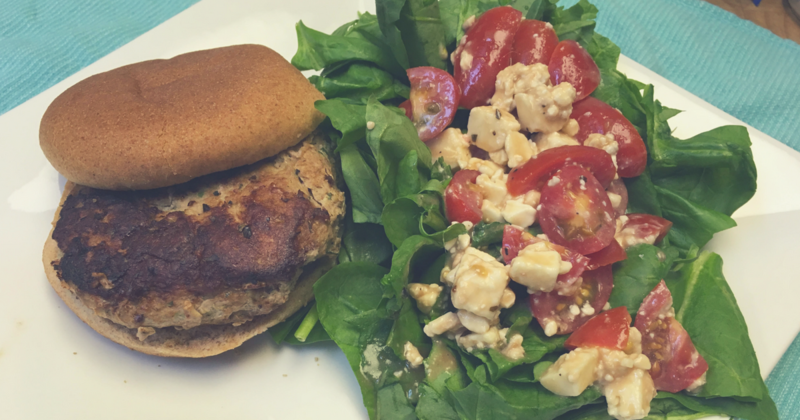 It comes together quickly and you can cook the burgers on a grill or stovetop. Zucchini makes these burgers perfectly juicy and the garlic and onion give them lots of flavor. I served them on whole wheat buns, but you could make a lettuce wrap, too. We had Greek salad on the side for a tasty, protein and veggie rich meal. Use paper towels to squeeze the liquid out of the zucchini. Combine ground turkey, zucchini, crumbs/oats, garlic, onion, salt and pepper. Make 4-5 patties, personal preference for size. Indoor cooking: Heat a large nonstick skillet on high heat. Put in a light coat of olive oil. Add burgers and reduce the heat to low. Cook on one side until brown, then flip. Grilling: Lightly coat grill grates with canola oil. Cook the burgers on medium heat about 5 minutes on each side, or until no longer pink in the center. You really do need to get the moisture out of the zucchini. I like to lay a couple layers of paper towels inside a thin kitchen towel, put the zucchini in the middle, and make a bundle to twist. I use a potato masher to break up the ground turkey and mix the burgers. My son loves to help with this part! The original recipe called for making 5 equal patties, but that doesn’t make sense for my family. We made burgers sized for our family members, and I started the adult sized burgers about 5 minutes before the child sized ones. These burgers worked great from the freezer! I tripled the recipe, and formed the extra mixture into patties. I layered those in parchment paper, slip them in a Ziploc bag, and froze them. I pulled them out of the freezer the morning I wanted to use them and let them thaw in the fridge all day. They were still perfect! Hope everyone is enjoying their summer! Next month I’ll be sharing some of my favorite summer salads. They’re great as sides or entrees!